The Coalition for Reforms and Democracy (CORD) has rejected the proposal by President Uhuru Kenyatta to form a Joint Select Committee of Parliament to spearhead dialogue on the issues surrounding the IEBC.According to them that will not offer any solution and talks should be held at presidency level not parliament. CORD’s position now throws President Uhuru’s plan into disarray, coming just hours after Jubilee nominated eleven members to the team to take part in the dialogue process. Jubilee had settled on Senators Kiaritu Murungi (Meru), Kipchumba Murkomen (Elgeyo Marakwet), Beatrice Elachi (nominated), Fatuma Dullo (nominated), MPs Cecile Mbarire (Runyenjes), Naomi Shaaban (Taveta), Moses Kuria (Gatundi South), Jimmy Angweyi (Kitutu Chache North) to take part in the dialogue. 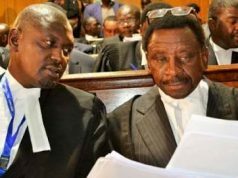 CORD had earlier chosen The legislators include Siaya Senator James Orengo, his Machakos counterpart Johnson Muthama, Tongaren MP Eseli Simiyu, Suna East MP Junet Mohammed and Mombasa Women Representative Mishi Mboko. Previous articleJUBILEE RELEASE LIST TO HEAD IEBC TALKS WITH MOSES KURIA IN CHARGE ! !